There are so many clichés about friends and friendships. A friend in need is a friend indeed. Any friend of yours is a friend of mine. With friends like that, who needs enemies? Birds of a feather flock together. Opposites attract. Okay, so technically the last one may be more meant for romantic relationships, but I’ve found it to be true in friend relationships, as well. As a card-carrying introvert, I can be hard to get to know. My friends have to be willing to accept that there are times I won’t talk about my troubles, that Friday nights are the alone time I’ve been looking forward to all week, and that sometimes we have to make two or three runs at lunch date plans before I’ll finally find the courage to stop canceling. All of my best friends are extroverts. They love to lunch and shop and—egads!—organize GNOs. They push me to join them, sometimes gently (“Let me know when you have an evening available for dinner. . .”) and sometimes with a shove (“I’m not leaving you alone until you say yes and are in your car heading toward my house.”). These are the people, the things, I need. Were it left up to me, I would seldom leave the house. Were I friends with an army of introverts—people just like me—I would never organize a party. Were it not for the energy and pressure from my extrovert friends—my complete personality opposites—I wouldn’t confide anything in anyone. I would be missing out on some of the deepest, most meaningful connections in my life. 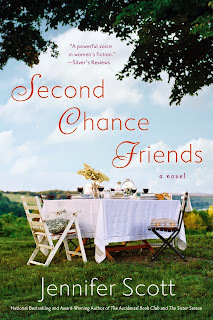 In many ways, the four friends who come together in SECOND CHANCE FRIENDS are opposites. Or at least not likely friendship candidates. Karen, whose child has grown, finds connection with Melinda, who has yet to have any children. Joanna is hiding from everyone and everything, yet won’t let Maddie Routh hide. Throughout the novel, these four friends use their, at times, opposing strengths, to push and pull one another along into a better place. They help each other grow. Just as my friends do for me. Because, really, that’s what friendships are for, I think. Pushing us and pulling us to a better place—places of love, places of comfort, places of hilarity, places of growth, places of connection. Because it’s when we begin to notice the similarities that are buried beneath our differences that real relationships are born.